The colorectal cancer statistics for 2016 are out. You are probably not itching to get into bed with a hot cup of tea and read it. However, you probably should. It is one of the most interesting things I have read all month, and one of the most infuriating. Colorectal cancer occurs in the cells that line the bowel, which begin to multiply uncontrollably to form first a non-cancerous polyp and eventually a malignant tumor. While there are several known genetic factors that mean some people are more predisposed to colorectal cancer, environmental factors play a huge role in the epidemiology of the disease. In fact, lifestyle choices such as healthy eating, exercise and low nicotine intake have all been linked to a better chance of avoiding colorectal cancer. Older people are at a higher risk of contracting the disease: people over 65 are 40 times more likely to be diagnosed with colorectal cancer than those under 50. However, public health efforts have made an incredible difference in the elderly population over the past decade. In the period of time between 2010 and 2013, 30% less people over 50 have contracted colorectal cancer and those who do are almost twice as likely to survive it. Thanks to a series of exceptional campaigns, attitudes have changed and older people are eating healthier, exercising more and smoking less. They are also taking more aspirin, reducing the inflammation that is often a key factor in the progression of the disease. Crucially, colorectal cancer screening has become routine for the over-50s. Screening has improved early detection, which can often catch the tumor while it is still in its non-malignant polyp stage and can be safely removed with surgery. In short, looking at the trends for colorectal cancer over the past few decades is a celebration of successful public health action and a demonstration of everything that science can accomplish when it informs effective policy-making. 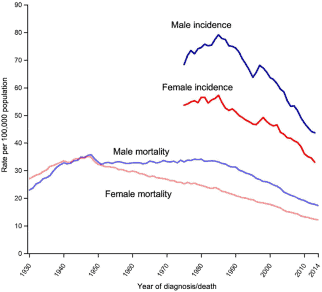 The rates of colorectal cancer incidence and mortality over the past few decades. 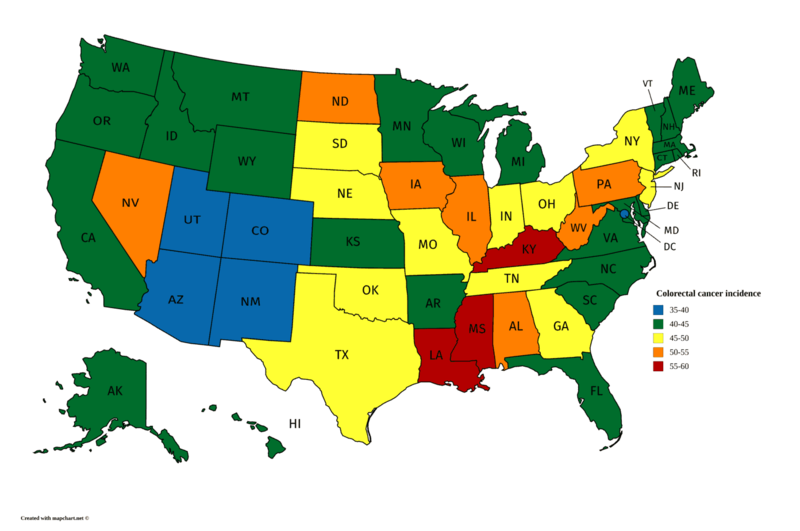 However, the tone of things changes somewhat when the stats begin separating colorectal cancer data by state. People from poorer areas are much more likely to be diagnosed with and die from colorectal cancer than people who live in wealthier areas. Since the quality of healthcare that is accessible to people in the US is generally speaking proportional to their income, we will focus solely on the incidence rates – that is, on how income affects the chances of getting colorectal cancer rather than being cured. The connection between lifestyle choices and colorectal cancer is a clear and well-established one. However, lifestyle is often not a choice. Poorer people often cannot afford to eat a healthy diet and exercise and are statistically more likely to smoke, all of which expose them to major risk factors for colorectal cancer. In fact, people who live in richer states have a lower chance of being diagnosed with colorectal cancer than people who live in poorer states. Mississippi is the poorest state in the union (with a 22% poverty rate) and has some of the highest rates of colorectal cancer incidence in America (54.2 for white males and 74.2 for black males). On the other hand, people in Maryland (where the poverty rate is under 10%) have a much lower chance of contracting colorectal cancer (the incidence rate is 41.5 for whites and 49.9 for blacks). Things get even worse when we start looking at the difference in colorectal cancer incidence rate between different ethnic groups. On average, non-hispanic blacks are about 30% more likely to be diagnosed with the disease than non-hispanic whites. Shockingly, they are 60% more likely to die from it. In 2015, the US Census Bureau indicated that African-Americans are more than twice as likely to live under the poverty line. Since lifestyle plays such an important role in colorectal cancer, this is are hardly surprising. 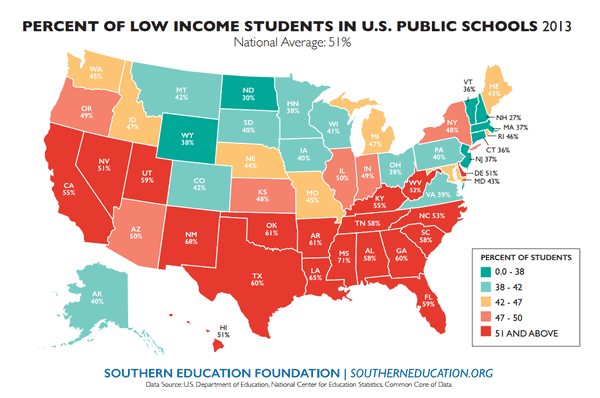 What is even more appalling is that the difference in incidence rates within each state seems to correlate with the levels of inequality in the same state. In Louisiana, white people earn on average 30% more than African-Americans, who are also 30% more likely than whites to be diagnosed with colorectal cancer. On the other hand, in Rhode Island (where income inequality between blacks and whites is one of the lowest in the country), African-Americans are actually slightly less likely to be diagnosed with colorectal cancer than caucasians. This correlation clearly indicates that the nation-wide disparity in colorectal cancer incidence rates is not due to a genetic predisposition from a specific ethic group, but is rather a consequence of income inequality aligning with racial divides. Colorectal cancer incidence rates are becoming a by-measure of inequality both between the rich and the poor and between different ethnic groups. The amazing public health work done over the past couple of decades has highlighted how improving lifestyle choices can dramatically decrease the risk of colon cancer in the aging population. However, raising inequality in the US (and around the world) means that lifestyle is not always down to choices. The next big challenge for the scientific community will be to give access to better lifestyle options to those who currently do not have access to them. Community initiatives have been shown to be effective in different settings, and made popular by the efforts of the former First Lady, Michelle Obama. Continuing this work is of vital importance, no matter who is in the White House. What do you think? How do you you feel about how increasing inequality is changing the landscape of modern public health? What role does biology play? E.g. if blacks and Hispanics are poorer on average and on average have higher colorectal cancer rates, which is the causing factor? The broad idea is that eating a balanced diet full of fiber makes bowel movement easier and therefore keeps the colon tissue healthy. Processed food tends to have the opposite effect and slightly damage the lining of the colon, forcing it to constantly regenerate. This leads both to a constant inflammatory state (which is well-known to be linked to carcinogenesis) and increased cell division, which is necessary for tissue regeneration and is also associated with the formation of tumors. In fact, when cells are constantly dividing and replicating their DNA, they are more likely to “make a mistake” – which translates into random mutations in the DNA. The accumulation of random mutations in the cell is at the basis of tumorigenesis: if you’re interested in how that works, check this out: https://time4science.wordpress.com/2017/01/20/the-hallmarks-of-cancer/. So people who have poorer access to high-quality food are at higher risk of colon cancer because the have unhealthier colons, regardless of ethnic origin. Does that make sense? Colorectal cancer is a dangerous issue faced by many in the world.Colon cancer can be cured if its detected in the early stage .Survival rate is very less if it is detected in the last stage. My friend was diagnosed with stage 1 Colorectal cancer in CSCS. I got good treatment and now I have completely healed.